a study of perspective with a gone pier…. 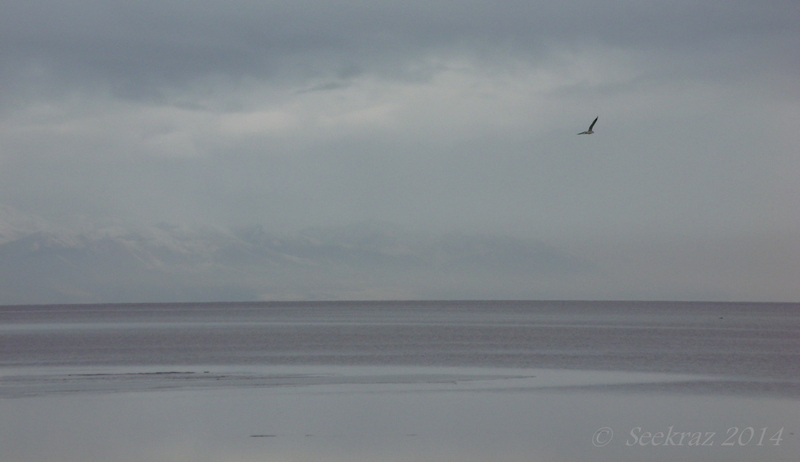 The following is yet another set of discoveries along the south shore of The Great Salt Lake…images made on a Saturday afternoon in late February, 2014…..depending on where you stand and where you are looking, you can see the Stansbury Mountains to the southwest, Stansbury Island to the west, Black Rock simply there in its curious prominence, or Antelope Island toward the north and east. For those interested, the pier pilings are the only remains of the Black Rock Resort. You can click here to be taken to a Deseret News article about the resorts that have come and gone from the shores of The Great Salt Lake…and, if you’d like, you can click on any photo in the following gallery to be taken to a slide-show that presents the images in a larger format. …south and west from the south shore of The Great Salt Lake, actually…and there are more than just clouds and mountains in the reflections on the water…memories running in varied scripts and images recalling the day, smelling the salt and saturated gray earth of the increasingly visible lake bed and hearing the cries of gulls on the freezing wind. I knew where I was going when I left the house that morning, but I can’t remember the time on the clock. I had been out to Antelope Island three weeks earlier and knew that I had to get to Stansbury Island, as well…it was just down the road, really, closer than Antelope…just head west on I-80…can’t miss it. From the house it would have been an easy 30-45 minute drive, maybe more….probably…..and five hours and almost 300 photos later, I was heading home again….I saw so many things that were new to me, walked in places that I had previously only seen on a map that was pinned to my cubicle wall at work or existed as ideas of potential things…notions…possibilities….places that filled my senses and soul with experiences that still live in tangible form these 15 months later. This is one of the last images from that trip…taken at 2:20 on a Saturday afternoon in late February, 2014. This is a wider angle of a similar image that you might remember from my earlier post, Sailboats on The Great Salt Lake. Looking west, that is Stansbury Island in the background…a continuation of the string of mountains that have the same name and extend several miles south from the lake. I spent a few hours on Stansbury Island and the south shore of The Great Salt Lake this past weekend…and while I know that I was a few to several hundred yards away from the freeway during much of the time, I can’t honestly remember hearing any of the traffic that passed behind me. I do, however, remember being entranced by the images of triangle sails moving ever so slowly on the lake’s horizon, the sounds of gulls calling above me, and the clouds that shone in their vivid whiteness in the crazy blue of the late February sky. All of that, combined with the chilly wind coming across the lake, made for an incredible afternoon. Carrington Island is toward the left of center and Antelope Island is toward the right. This is the east side of Stansbury Island, the second largest island in The Great Salt Lake, just west of Antelope Island. 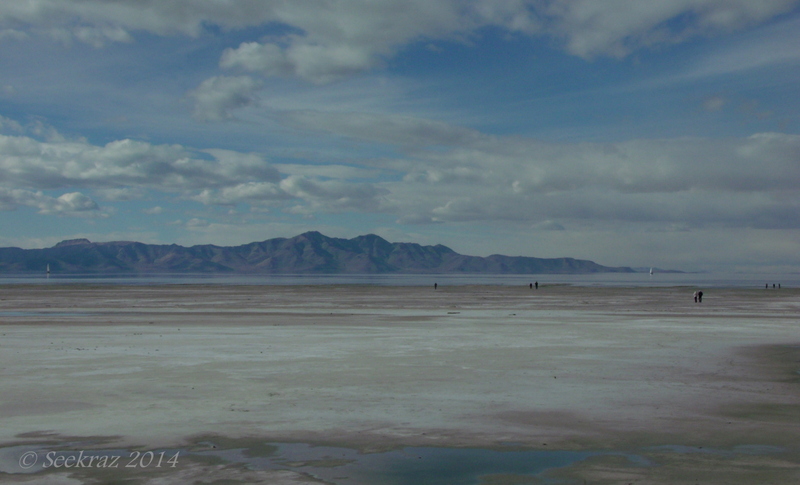 The water level of The Great Salt Lake is incredibly low….